NONPROFIT LIFE CYCLES - HYPE OR REALITY? Lots of the literature now asks you to consider where your organization is in its “life cycle”. Some of the diagrams and descriptions are so dense they give me a headache and my eyes glaze over. But the reality is that every organism has a life cycle- from a nematode to a human to a business to a non-profit and many more examples along the way. We remember from Biology 101 the great diagrams and we know from our own experience that various parts of our body and mind mature and change at differing rates. We take intervention steps to align these elements in order to remain as healthy and active as possible. Why should an organization not have a life cycle of its own? There are many moving parts and they don’t all remain in alignment as an agency grows and matures. Now look at your organization and create a matrix using the above. Where are your stages and elements in alignment? Should they all be at the place? Where do you need intervention in stages 1 through 4 to avoid stages 5 and 6? Where do you need emergency response for elements in stage 5 and potentially 6? There are key questions to ask at each stage to identify obstacles and opportunities. In addition there are some proven “transition” steps to help you move forward and/or reverse course. As many of you know my watchword for nonprofits is INTENTION. Examining the places in your organizations life cycle and being “intentional” about positive intervention will allow you to reimagine, regroup and regenerate. Life Cycle adapted from and expanded upon “The 5 Life Stages of Non-profits” by Judith Sharken Simon. 1 c. marinated artichoke hearts, cut in ½ or 1/3rds depending on size. I buy all the ingredients at Costco. Place shrimp on baking sheet. Toss lightly with olive oil and herbs de province. Bake for 15-20 minutes and check for doneness; do not overcook. Mix adding olive oil, lemon juice and champagne vinegar to taste. You may also add salt and pepper but use a light hand with the salt because of the salt in the capers and cheese. Some people like more or less capers, artichokes and cheese. Please yourself, you’re the cook! I’ve gone back to school this fall! Villanova University and the Philadelphia AFP chapter are offering a 10 week course in Fundamentals of Fundraising. I enrolled. It is taught by leading practitioners in the field and there are almost 50 of us in the class. Experience levels vary widely as do the agencies represented, everything from Eastern State Penitentiary to Hagley Museum. The presentations are comprehensive and the questions and ideas are thought provoking. We sometimes work in silos and forget how large and varied the nonprofit community is. Even though you may have successful approaches to problems and projects it is good to learn about other approaches that have proven successful too. Having a comprehensive refresher opens your mind and at times pushes you beyond your comfort zone. Learning is an ongoing process. I am excited to be in a structured learning environment again with such well-informed presenters, interesting topics and engaging and committed classmates. I recommend continuing education to everyone. Workshops, retreats, on-line offerings and classroom programs all give us the opportunity to expand our horizons. Indulge yourself and learn some new tricks. It’s well worth the time. Now I have to get back to preparing for next week…..Major Gifts is the topic. But before I go, here is a quick, easy recipe for a fall favorite! When you think of school, an apple for the teacher might be one of the things that comes to mind. 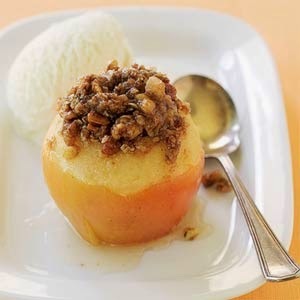 And baked apples are an easy, delicious way to enjoy the taste of autumn. Pair with ham, roast pork or chicken for a tasty side dish. Or top with ice cream and drizzle with caramel sauce for a comforting dessert. This is an easy and fast microwave baked apple recipe. 2. Mix the sugar and spices and dried fruit together. Place the apples in a deep glass or pyrex baking dish. Spoon the sugar and fruit mixture into the apples. Place one teaspoon of butter on top of each apple, cover. 3. Microwave the apples on high for 5 to 6 minutes or until fork tender. Let the apples sit for a few minutes before serving. Fundraising Effectiveness or Three Steps Forward, Two Steps Back! For every $100 gained through fundraising in 2011-2012, $96 was lost through gift attrition. Gains of 866,000 new donors were offset by losses of 909,000 lapsed donors for a negative growth in donors of 44,000. Larger organizations fared much better than smaller ones; organizations raising over $500k had an average net gain of 16.6%, organizations in the under $100k group had an average net loss of -13.5%. The average donor retention rate for all categories is 41%. The retention rate for first time donors is even more dire: 22.9%, but if you can get the second donation it jumps to 60.8%. The total of philanthropic giving in the USA has remained at 2.0% of GDP for the past 40 years. It costs less to retain and motivate an existing donor than to attract a new one. Taking positive steps to reduce gift and donor losses is the least expensive strategy for increasing net fundraising gains. Have you established a donor retention goal? Does the retention rate measure by donors and dollars? Do you know downgrades as well as no gift at all by donor? Have you gotten advice from the experts, Clair Axelrad, Dr. Adrian Sargeant and Tom Ahern specifically? Tom was the keynote speaker at last November’s Philanthropy Day in Delaware. Adrian Sargeant will be the 2014 Philanthropy Day (Delaware) keynote. Think of ways to make net gains instead of always trying to make up lost ground. FEASIBILITY STUDIES AND CAPITAL CAMPAIGNS- WHY BOTHER? Happy New Year! What resolutions have you made for your organization in 2014? Is it time to rethink your organizational strategy? Or, as the economy continues to improve, is it time to think about a capital campaign? And if so, should we do a feasibility study? Many times when we visit a potential client there is someone on the interview team who invariably says “This feasibility study thing seems like a lot of money to spend to decide if we can raise money!” If the feasibility study has a positive result it may seem like an unnecessary effort. Likewise, if the results say more work needs to be done before a campaign can begin then there is a feeling that the money was wasted. In many ways it reminds me of horsemen and veterinarians. When the horse is sick they call the vet. If the horse recovers the thinking is that you didn’t need the vet; if the horse doesn’t recover what good was the vet anyway. So, hindsight says the vet only cost money but didn’t add value. Well, you should know I always paid my equine vet bills, even before my daughter grew up to become one. 1 Why do we need a feasibility study before mounting a capital campaign or any special fundraising campaign? A comprehensive will help you decide whether, when and how you should begin a major campaign of any sort. It will show you how you are perceived by your constituents and in the community, identify potential volunteers and donors and assess perceptions of how the campaign will support and strengthen your mission. 2 Why can’t we conduct an in house study and save money? You need candid responses from respondents, not responses based on what friends and acquaintances think you want to hear. An independent third party, the consultant, gives the distance needed to elicit unbiased answers. In addition, in house studies do cost money: if conducted by staff what are their costs and what doesn’t get done when tasked with this assignment? What specifically can be learned from a feasibility study? How much money you can raise. How long it will take to meet your goal. How much it will cost to raise the funds. Whether or not you have the infrastructure able to mount and sustain a campaign. Whether or not the timing is right for your campaign. 4 What additional benefits can be gained from a feasibility study? How much does a good feasibility study cost? Costs range from $15,000 to $45,000 depending on the scope and complexity of the study. The fee should include drafting the case statement, developing the interview lists from a cross section of key prospects and community leaders, conducting the actual interviews in person, and producing a final report that will serve as a working document with recommendations for going forward. What questions should a consultant be prepared to answer before being engaged? Before asking these questions you should have preselected firms to interview who have presented a clear, comprehensive and cost effective proposal. What is the firm’s experience with similar organizations? What will the consultants relationship be with staff and board members? Who will be assigned to our project and what are their credentials? Everyone can use a little luck. You know the old saying, "You are what you eat." Well if this Bon Appetit article is any indication, here are 10 ways to eat your way to good luck in the new year!